Powers/Abilities: War Monarch possesses a suit of hi-tech armor that presumably allows him to perform a variety of superhuman feats. He also has shown the ability to project holographic images of himself. His alliance with Thanoseid provided him with access to Apokoliptan Boom Tube technology. (Bullets and Bracelets#1 (bts)) - The man known as Jim Rhodes was once a "close" friend of Diana Prince (and was possibly romantically involved with her for a time). But Jim Rhodes then became the War Monarch and underwent a personality change, becoming estranged from his former friends in the process. (Bullets and Bracelets#1) - "Final Thrust" - As Diana Prince and the Punisher (Trevor Castle) searched for their kidnapped son Ryan in the stronghold of the organization known as the Hand, War Monarch (who was rumored to be the one behind Ryan's abduction) appeared as a holographic image and trapped Diana and Trevor between two brick walls. War Monarch admitted that he was the manipulator of the scenario, but claimed that he was not the true power or motivator behind the abduction of Ryan. Diana Prince attempted to appeal to the human side of War Monarch and pleaded with him to take her to her child. But War Monarch responded that he was no longer the man she once knew as Jim Rhodes. Nonetheless, War Monarch opened a Boom Tube under Diana and the Punisher that transported them to Apokolips where they eventually found their kidnapped son. War Monarch's true intentions and allegiances remained unrevealed. once someone who was good who went bad. same place at the same time to be sent to Thanoseid. Is he working WITH or AGAINST Thanoseid? by Thanoseid? Wish I could tell you for sure but I really don't remember." Q: Was War Monarch intended to be affiliated with the Hand in any way? alliance would be just speculation . . . or a story to be told another day in some parallel universe to ours! 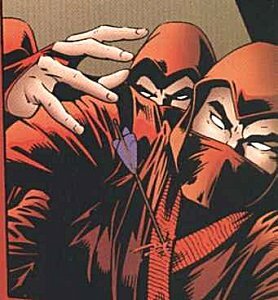 The Hand is a clan of villainous ninja assassins. In PUNISHER #90-99, the Punisher (Trevor Castle) was led to the Stronghold of the Hand during the search for his kidnapped son, Ryan Castiglione. Likewise, in DIANA PRINCE, FREELANCE#90-99, Diana Prince also traveled to the Hand stronghold in search of her son Ryan. The Punisher and Prince finally crossed paths at the Hand stronghold in BULLETS AND BRACELETS#1 and opened fire on the clan of ninjas. Many of the Hand ninjas were killed in the unrelenting onslaught of bullets and arrows, but a few mannaged to escape with their lives. The Hand is an Amalgam Universe version of the Hand of the Marvel Universe.